Tuesday, November 21, 2017 will ever be a memorable day in the heart of Wigan forward Ryan Colclough as he scored two goals for his club before rushing to the hospital to welcome his new child. According to the report by Mirror, the 22-year-old Englishman was substituted after scoring two goals against Doncaster and immediately rushed to the hospital.Ryan Colclough did not even have the time to change out of his kit as he was was happy after being told that his woman has put to bed. 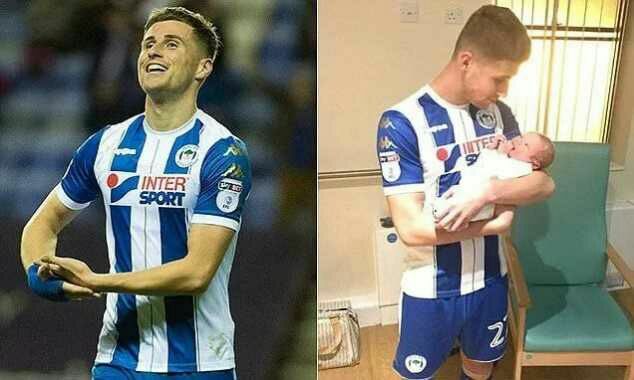 Wigan chairman David Sharpe shared a pictureon Twitter of Colclough looking down at his newborn child in a hospital ward.Colclough said on Twitter:"What a great result and team effort from all the boys. "I'm so happy to mark the birth of my second son with two goals and the win he made it a hat-trick for me,'' he said.